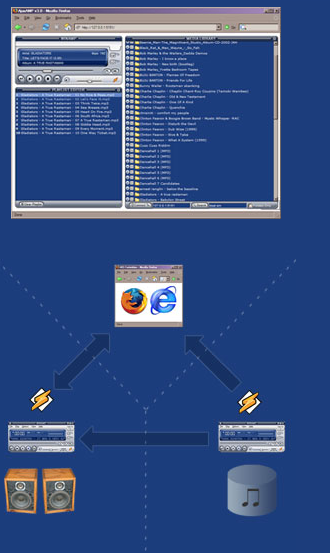 AjaxAMP web plugin lets you access winamp over the network using a web browser. It creates a web based User Interface of winamp installed, inside the browser.It has its own Media Library which allows you to browse, search, and sort through your music and to drag-and-drop folders or music files onto the playlist. Use one computer to stream music from a 2nd computer to a 3rd computer. Make sure you have Winamp installed. Download the AjaxAMP installer. Run it. It will put a file called gen_AjaxAMP.dll in your Winamp\plugins folder.